Obituary for David Cox | W. J. Dooley Funeral Service Ltd. It is with sadness that we announce the passing of our dear husband, brother, uncle and friend, David Cox, 91, on Saturday, January 19, 2019 at the Cape Breton Regional Hospital. 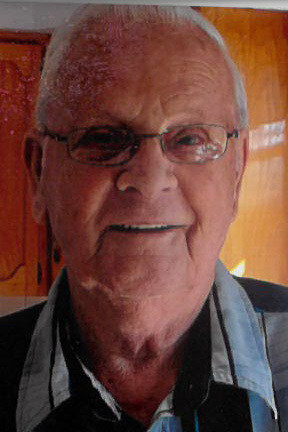 Born in North Sydney on June 26, 1927, he was the son of the late Richard and Martha (Confiant) Cox. Dave worked for many years at Steele’s Esso garage in North Sydney. He enjoyed talking about old cars, puttering in his barn and going for drives with Nellie. Dave was a kind-hearted man with a sharp wit and enjoyed making people smile. Dave is survived by his wife of 49 years, Nellie (Andrews) Cox; his “guardian angel” Diane Gillis; three brothers, Clifford (Cathy), Grand Prairie AB, John, North Sydney, Michael, Cape Cod, Mass. ; a sister Marion MacKinnon of Sydney; sisters-in-law, Bridget Cox and Jane Cox, as well as several nieces and nephews. Besides his parents he was predeceased by three brothers, Harold, Louis, Bobby, sisters, Ella, Caroline and Irene; brother-in-law Michael MacKinnon and sisters-in-law, Dora, Mary and Shirley. There will be no visitation by request. A funeral mass will be held 10:00 a.m. Thursday, at St. Joseph Church, North Sydney, with Rev. Doug MacDonald presiding. Burial will take place at a later date in Holy Cross Cemetery. Funeral arrangements are under the care and direction of W.J. Dooley Funeral Home, 107 Pleasant St., North Sydney.